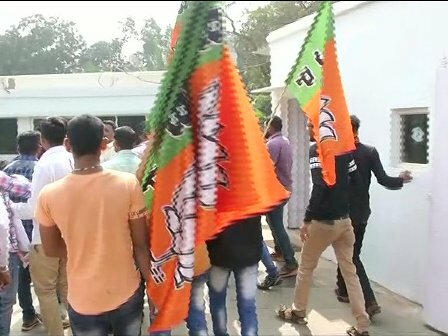 ONI Bureau: A group of BJP workers barged into CM Naveen Patnaik’s Private Secretary VK Pandian’s official residence and ransacked the premises. They damaged the flower pots and vehicles and hurled cow dung at his house while pelting stones. They accused him of ruining Odisha by misusing the power given by him. BJP State Vice President Samir Mohanty justified the action, saying no serving IAS Officer in Odisha so much power or importance in the past. Pandian is acting as the Super CM, which is not acceptable to people of the state, he said. Police Commissioner YB Khurania condemned the act and said all guilty will be arrested and punished under law. “This is not acceptable”, he said. BJD spokesperson Pratap Deb demanded strong action against the miscreants, saying such ‘physical assault and Hitler Act’ won’t be tolerated. Update: 5 BJP Workers have been arrested by the police in connection with the incident. IAS Officers’ Association and OAS Officers’ Association condemned the attack and sought action against the culprits.